Brand from Japan: Canmake. Oval nib allows you to create both broad and fine lines. Waterproof formulation enables it to withstand both water and sweat. Twist-up type. The oval nib allows you to create both broad and fine lines with just the one pencil. Won't run or clump. Create effects of light and shade by applying in layers. Twist-up mechanism eliminates the need for a sharpener. Twist up so about 2mm of the nib is showing. On the part of the eyebrow closest to your nose, angle the flatter part of the oval downwards and smudge lightly. 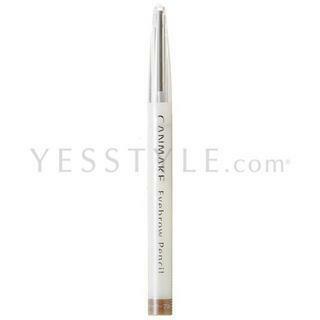 Use the finer part of the oval on the outer end of the eyebrow, drawing a fine, dark line.